“Benefit for years not only had its daily round of fine driving, but it was the focal point for almost all of the processions in town…. In 1790, when Washington paid his last visit, there was a great jubilee. Rhode Island had at long last ratified the Constitution and like the prodigal son must be properly welcomed into the family circle. So Washington came, and brought with him Thomas Jefferson, Secretary of State…. Although Washington, then an old man, seldom went out at night, he broke his custom that evening and strolled about with Jefferson…. The following morning he again went out to see the town…. The trouble began with an argument over Rhode Island’s constitution. Rhode Islanders made a very odd choice following the Revolution. Instead of forming a new democratic government, they opted to retain their old royal charter. This charter enshrined some concepts that seemed increasingly un-American as time passed. At the core of the dispute was the requirement that a citizen had to own property in order to vote. The waves of Irish immigrants who had come to work in the factories were locked out of the political system. It’s estimated that by the 1840s over 60 percent of the state’s white male population was forbidden to vote. Calls for reform were repeatedly rebuffed by the charter government, so suffrage advocates held their own constitutional convention and organized a statewide referendum in which all white males of 21 years of age or older could vote. Surprisingly, it received a majority not just among the newly enfranchised but also among the landholders. The old charter government hadn’t given their blessing for the referendum and refused to recognize its legitimacy so two elections were held, one to elect a government under the People’s Constitution and one to elect a government under the charter. Rhode Island suddenly found itself with two competing governors, Thomas Wilson Dorr for the constitution and Samuel Ward King for the charter. The charter government decided to arrest the members of the rival government. After several of his lawmakers were snatched up, Dorr, who had previously been a rather lackluster lawyer and had no military training, rashly decided it was time to arm his supporters. No battle took place, but many Dorr supporters were arrested. Dorr went into hiding but he was captured and sentenced to life in prison for treason against Rhode Island, but he proved too popular to jail. While Rhode Islanders hadn’t been willing to go to war for him, they still believed in the cause he championed and made freeing “the People’s Governor” a cause célèbre. Dorr walked out of prison 1845 after serving one year and was exonerated in 1854, shortly before his death. Whether he was a democratic visionary or a misguided revolutionary (or both), Thomas Wilson Dorr went to his grave unrepentant. “In the old days everything went up Benefit street, as a matter of course…. Much to the delight of the children of a latter day, little Tom Thumb drove the length of the street, in the tiny coach given him by Queen Victoria and drawn by the smallest horses in the world…. On St. Patrick’s Day, in early days, there was a gay parade in which tall silk hats of any vintage were jauntily worn at any angle…. In 2017, a street on College Hill known as Magee Street was renamed Bannister Street to honor Edward Bannister and his entrepreneur and philanthropist wife Christiana Bannister. William Fairchild Magee, for whom the street had previously been named, was involved in both slave and opium trade. Elyssa Tardif, “Providence Art Club,” Rhode Tour, accessed December 2, 2018, http://rhodetour.org/items/show/184. Beth Comery, “This Street is History,” Providence Daily Dose, accessed February 5, 2019, https://providencedailydose.com/2019/02/01/this-street-is-history/. “Benefit Street was also involved in a first-class mystery or murder—the Barnaby case…. The principal suspect was Dr. T. Thatcher Graves, whose picture shows him to have been a dapper-looking man with side-burns and flowing moustaches. He lived in the block opposite the Athenaeum, known as Court-house Row. Sissieretta Jones was a gifted and internationally known soprano. Trained at the Providence Academy of Music, Jones made her New York debut in 1888 at Steinway Hall, and in 1892 became the first African-American to perform at Carnegie Hall. She also performed at the White House for President Benjamin Harrison. By the time her 28-year career ended, Sissieretta had performed in Europe, South America, Cuba, the West Indies, Canada, and extensively throughout the United States, appearing in 46 of the contiguous 48 states. Born in Virginia, Matilda Sissieretta Joyner later moved with her family to Providence and settled at 20 Congdon Street, near the Congdon Street Baptist Church. As a young girl, Sissieretta and her mother lived 7 Jackson Court (a street that used to be between Benefit and North Main Street) and attended Meeting Street Primary (now home of the Providence Preservation Society) and later the Thayer Street Grammar School. After retiring to Providence in 1915, Jones spent the remainder of her life on the city’s East Side. She lived quietly in her nine-room home at 7 Wheaton Street (now Pratt street), where she enjoyed tending her rose garden and occasionally singing in the choir of the Congdon Street Baptist Church. At one time she had owned another property on Wheaton Street and one at 15 Church Street and 94 Benefit Street. The Church and Benefit street houses still remain, but both Wheaton Street houses are gone. In 2012, the Rhode Island Black Heritage Society honored Sissieretta’s memory by placing a plaque near her home site on College Hill at the intersection of South Court and Pratt streets, just east of Benefit Street. Marisa Brown, “The Home of Sissieretta Jones,” Rhode Tour, accessed February 5, 2019, http://rhodetour.org/items/show/59. Maureen D. Lee, Sissieretta Jones, Providence’s Famous Soprano, Small State Big History, accessed February 5, 2019, http://smallstatebighistory.com/sissieretta-jones-providences-famous-soprano/. The horror fiction writer H. P. Lovecraft was born and spent most of his life in Providence. He lived on College Street and numerous Mile of History buildings and figures are woven into his writings, including the Providence Athenaeum, the Providence Art Club, the First Baptist Church, Prospect Terrace, the Old Court B&B, the Fleur-de-Lys building, the John Hay Library, and house at 135 Benefit Street (setting for “The Shunned House”). Providence Library Digital Collection: Laurence E. Tilley Photograph Collection—197 black and white photographs of residential architecture and street views in Providence, Rhode Island taken by Lawrence E. Tilley in 1958. The photographs document the College Hill neighborhood. 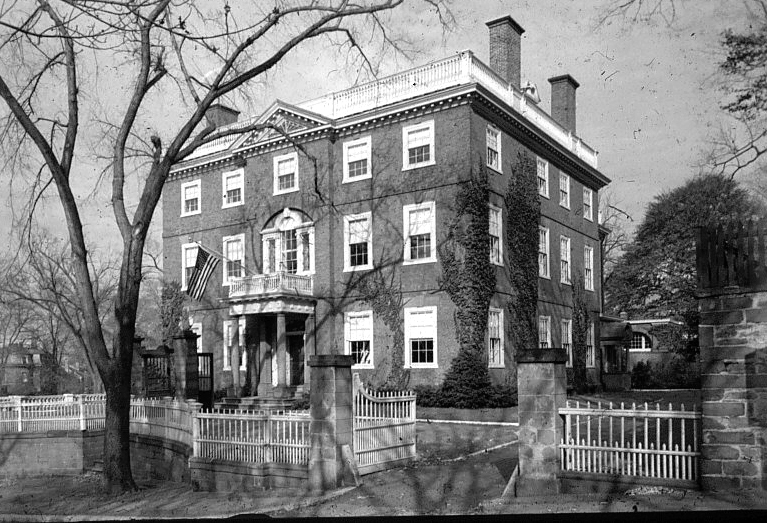 Mary A. Gowdey Library of House Histories—Database of histories and photographs of Providence houses listed by street. Rhode Island Publications Society—A nonprofit educational and cultural foundation incorporated in 1981 under Rhode Island law to publish and distribute works relating to Rhode Island’s history, economy, and cultural life. Rhode Island History Journal—Rhode Island History is a peer-reviewed journal on Rhode Island’s rich and varied history that is published semi-annually by the Rhode Island Historical Society. Cady, John Hutchins (1957). The civic and architectural development of Providence 1636–1950. Providence, RI: Providence Book Shop. Caldwell, Samuel, L. & Gammell, William (1877). History of the First Baptist Church in Providence, 1639-1877. Providence: J.A. & R.A. Reid. Lancaster, J. (2003). Inquire within: A social history of the Providence Athenaeum since 1753. Providence, RI: Providence Athenaeum. Lee, Maureen D. (2013). Sissieretta Jones, “The Greatest Singer of Her Race 1868–1933,” University of South Carolina Press. Lemons, J. Stanley (2001). The First Baptist Church in America. Providence, RI: Charitable Baptist Society. Miner, George Leland (1992). Angell’s Lane: The history of a little street in Providence. Ann Arbor, Michigan: UMI. Stillwell, Margaret Bingham (1943). While Benefit Street was young. Providence: The Ackerman-Standard Press. Stillwell, Margaret Bingham (1945). The pageant of Benefit Street: Down through the years. Providence: The Ackerman-Standard Press. de Jong, David Cornel (1942). Benefit Street. NY: Harper and Brothers. Lovecraft, H. P. (2018). At the mountains of madness [e-book edition]. London: Penguin Books. Have a Mile of History Story to Share?